The Rivers State Governor, Chibuike Amaechi, has slammed Nigerian labour unions for not doing enough to fight for a better governance for Nigerians. Vanguard online reports that Gov. Amaechi made this statement on Thursday at a May Day rally in Port Harcourt, Rivers State. It was gathered that the governor said the Nigerian labour unions knew the problems confronting the country but were running away from the solution. “The Chairman of TUC took me back to my school days. He was able to analyse the problems of Nigeria. It was typical of TUC and NLC in Nigeria; they know the problem, the solution, but they don’t want to go for the solution. I don’t know why and I don’t know if they have compromised,” Amaechi reportedly said. 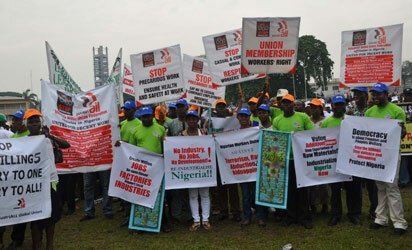 * Cross section of Nigerian workers during the 2014 Worker’s Day commemoration at Onikan Stadium, Lagos Island. While commending past labour leaders for actively involved in the struggle to consolidate the nation’s democracy, the governor added that the current group of labour leaders have failed to ask for good governance from Nigerian leaders. He accused the labour leaders for enjoying with politicians they are supposed to keep on their toes, saying as a result, ‘the poor masses are suffering because they have nobody to speak for them’.